Owners and volunteers show some homes from previous events in short videos. These videos give some insight into the process and intentions behind the build or refurbishement. We are looking for funding for future events but don’t have a Brighton & Hove event planned currently. We are always looking out for houses or buildings to showcase in the event, built or renovated to a high standard of environmental performance. If you would like to be involved in any future events, either opening your house or building, or as a volunteer, please contact us. It doesn't necessarily take expensive renovation to cut bills: behaviour changes and small alterations can make a big difference. Discover practical steps to reduce energy use, water use and carbon emissions in our own homes from the experiences of Eco Open Householders. Funding options to help you renovate your home are described in Ways to pay. You may be interested in finding out more about what you could do to your house. 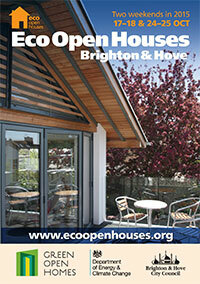 Have a look at the Eco Renovate Your Home course and some of the possible funding options outlined in Links. Click on the PDF above for last years events brochure. Brighton & Hove Energy Services Co (BHESCo) will be hosting free and impartial energy advice shops at various locations throughout November and early December 2016. This years event is part funded by Brighton & Hove City Council.